If you were Bella, who would you pick? Once a rage, still a heart throb – Edward Cullen. A modern literary character has never been idolized so much in recent times (Except Harry Potter maybe, but even then, it’s just not the same). Pay no heed to the fact that he exists only on paper, or he is a vampire, or a blood sucker or has no soul (can’t blame Bella much, right?) I, for one, fell in love with him, so much that, every guy I met for a period of 2 months was subjected to a comparison with Edward (inside my mind of course). Sharing the spot in teen girls’ hearts – Jacob Black, a.k.a the “friend”! Portrayed as Bella’s rebound guy, Jake’s physical description does nothing to make hearts skip a beat. (The movie is a different issue!) But he is the best he-friend any girl would die to have. Think about it – the guy puts up with all of you and your nonsense, BUT, no romantic entanglements. You just cannot ask for anything better, right ? As far as the book alone is considered, Edward wins, hands down. Stephanie Meyer has described him as just short of God himself (actually, she even compares him to the Greek God, Adonis). Perfectly chiseled looks, a glistening body, plays the piano, well read, well travelled, romantic and the icing on the cake is his undying love for Bella. 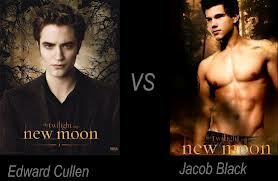 Jacob doesn’t fail either, but he just doesn’t compare to Edward (at least in the book). Somehow, no matter what Jacob does, he just falls short of Edward. It was. And I just realized the typo. Thanks! doesn’t taylor lautner play the character of “Jacob’? ?